“He doesn’t have any media attention,” Jordan said. Michael Jordan said that in a 1985 Los Angeles Times article on Derek Smith by Mike Downey titled “Sure He’s Unknown, But It Doesn’t Mean He’s Not Rock Solid“. It’s no coincidence that a rookie Michael Jordan expressed such high praise for Derek Smith. After all, Jordan had to match up against the thriving two guard. MJ’s first season in the league overlapped with the breakout year of the 23-year-old Smith. In fact, Michael Jordan’s 23 points per game where overshadowed by Derek Smith’s 28 per game the two times Jordan’s Bulls faced Smith’s Clippers. The standout of the two bouts between both sides was a close and highlight-packed game at the Los Angeles Memorial Sports Arena on November 30, 1984. However, those who know about Smith remember certain other plays, too. On one occasion, Smith ducked under Jordan’s outstretched arm for a fly-by poster dunk. On other possessions, Smith overpowered the heir apparent for made baskets. They remember the 12 for 17 performance overall the Louisville Cardinal had from the field. When you consider Jordan’s fame and the power of his legacy, it’s understandable that Derek Smith’s performance is the one which is lost in the annals of basketball history. Unfortunately, Derek was also held back from ever creating a proper basketball legacy of his own. Smith blew out his knee just nine games into the following 1985-86 season. He was averaging 27.1 points on 55.9 percent shooting, surely on his way to a second straight season of at least 22 points per game on at least 53 percent from the field. Since the NBA’s inception in 1946, only 18 players have recorded two such seasons and all of them are either in the Hall of Fame (like Kareem Abdul-Jabbar and Wilt Chamberlain) or on their way to it (LeBron James and Amar’e Stoudemire), with 80s scoring ace Kiki Vandeweghe being the one exception. In short, statistics like those mostly are reserved for only the most dominant of big men. And then there’s Derek Smith, robbed of a promising professional career due to injuries. He passed away in 1996, and is just as unknown today as he was when Mike Downey wrote that article for the Los Angeles Times back in 1985. He was even unknown as a high school player in his home state of Georgia. “Even though we both were from the state of Georgia, I had never heard of Derek’s name,” said Wiley Brown, Derek Smith’s future teammate at the University of Louisville. About a week after meeting with coach Olsen, Kenny Robinson brought in a scrapbook to prove to him that a trip to Georgia for an unknown 15-year-old would be worth his time. “That’s when I made a decision to go down (to Georgia) and see if he was as good as Kenny said he was,” said Olsen, who later became Louisville’s athletic director. The one thing which still stands out about that practice for Olsen, besides the quickness and ball-handling abilities Derek exhibited, was his performance in one particular drill. “It’s ironic that two players as good as Derek and Larry Bird were pretty much unknown outside of maybe their own schools and their own coach,” summarized Olsen who also recruited a young Bird — whom was not to be found in any recruiting publication — from French Lick, Indiana. First recruited by Olsen some time around his fifteenth birthday and already playing for the University of Louisville at the age of sixteen, Derek Smith was a hidden gem living about 60 miles south of Atlanta. Smith was brought up a few miles outside of Hogansville, rural Georgia, a one stoplight town with a population of about 3000, where he went to school. He lived in a small community called Corinth which has become an unincorporated community since then. “Derek literally came from nothing,” said former NBA player Jim McIlvaine. McIlvaine shared an agent (Ron Grinker) with Derek Smith. Every conversation about Derek’s upbringing involves some statement like that, and rightfully so. He grew up in a little house with a dirt floor and no indoor plumbing. It had formerly been a slave’s cabin, according to Russ Brown. An outhouse served the role of a bathroom. The house sat by a red clay road which had 15 to 20 other little houses on both sides of it that were once home to sharecroppers. His mother, Maybell, worked at a sewing factory and raised Derek and his five siblings alone. That discipline manifested itself into Derek becoming an inquisitive person who also had other interests than basketball. Despite the experience of playing basketball on the red clay of Corinth, it wasn’t until the eight grade that Derek Smith started to play organized basketball. Playing for coach John Penland, who wisely had his tallest players go through drills traditionally meant for guards, Derek was a 6-4 center with very good ball-handling abilities and lateral quickness, all of which helped him get recruited by the Louisville Cardinals, who looked for well-rounded players. The Hogansville High School team won two state championships with Derek on the team. That didn’t mean though that the players had any major aspirations. Derek Smith himself once characterized the low expectations of the youth in the small Georgia city. In 1978 Derek arrived at Louisville, Kentucky to start college. The small-town kid had one grocery sack with him. It contained all of his possessions. Having attended school so early, Derek Smith turned 17 when his freshman season for the Louisville Cardinals was already on its way. Lacking in age and muscle, the freshman forward made up the deficit with his irrepressible effort. Derek averaged 9.8 points and 4.8 rebounds in 19.4 minutes per game as an underaged freshman in 1978. By the following season he was already a starter for coach Denny Crum’s Cardinals, having proved himself as a capable rebounder, any size disadvantage notwithstanding. High-flying phenom Darrell Griffith and 6-8 big man Wiley Brown rounded out Louisville’s 1979-80 starting lineup which ultimately won the NCAA National Championship. Meanwhile, Derek was also making strides off the court, demonstrating his desire to succeed at everything he did. For the kid out of Hogansville, attending the University of Louisville was, perhaps, as much about studying and graduating as it was about basketball. Smith, a small-town kid, arrived at Louisville socially unprepared for college and his experience there helped him mature and blossom as a person. Meeting Monica, whom he married three days before his first NBA training camp, allowed Derek to develop confidence. When Derek spoke, he wouldn’t finish all of his words which could sometimes confuse members of the Cardinals team. While it wasn’t Derek’s language, his speech reminded coach Olsen of Gullah, a creole language spoken in states like Georgia and South Carolina. It came as a bad surprise to Derek himself when he first heard himself speak. Derek worked at public speaking just as hard as he worked on the basketball court. He was so diligent about going to his voice and diction classes that he showed up for one the morning after Louisville’s team had arrived back at campus in the middle of the night following their National Championship win against UCLA. Smith, even though he had already played nine years in the NBA, returned to Louisville in September of 1991 to complete his communications degree, per Rick Bozich of the Louisville Courier-Journal. After averaging 15.3 points and 7.4 rebounds per game his sophomore through to senior years, Derek Smith finished his college career at Louisville having scored the second most points in the school’s history (Smith now ranks seventh in 2016). He also had the 1980 NCAA Championship to his name, which was won in large part thanks to two huge free throws Smith made in the last minute of the tight final game against Larry Brown‘s UCLA team of Kiki Vandeweghe, Rod Foster and Mike Sanders. However, when the 1982 NBA draft rolled around, Derek Smith wasn’t among the most highly coveted names. When looking back at his status as a starter on an NCAA title team, Derek pointed to the rather small recognition he received. Following the 1980 title and Darrell Griffith’s transition to the NBA, Derek actually lead Denny Crum’s Louisville team in scoring both his junior and senior year. He also was the leading rebounder one of those years. The Cardinals came close to the National Final in 1982, Derek’s senior year, but were halted in the 1982 National Semifinal by Georgetown, a team featuring freshman Patrick Ewing. They lost 46-50. The year before their tournament run was stopped by a miraculous game-winning shot from halfcourt by U.S. Reed from Arkansas. Griffith averaged 22.9 points per game in 1979-80 for a Louisville team which scored 76.9 per contest and was the first Cardinals’ 20-point scorer since Jim Price in 1971-72. The Golden State Warriors ended up selecting Derek Smith with the 35th pick in the 1982 NBA draft’s second round. His stint with the Oakland team proved to be a short-lived one, though. Head coach Al Attles opted to play Smith in the power forward position, one which he at times had filled playing for the somewhat position-less and undersized Cardinals. The size of NBA front-court players, however, proved to be overbearing for the 6-6 Derek Smith. Yet getting any burn on the perimeter wasn’t exactly an option either. Warriors’ center Chris Engler, who was drafted one round after Derek, pointed out that between names like World B. Free, Sleepy Floyd and Micheal Ray Richardson there wasn’t much extra playing time to be found at the guard’s positions. “Al kind of liked the veterans and certainly we weren’t that,” laughingly said Engler, who roomed with Derek on road trips that season. Thus playing time came sparingly and Derek only clocked 154 minutes in the 27 games he got on the court. However, his legendary work ethic and persistent spirit remained sound. Derek was waived by the Warriors soon after his first year in the league. Suddenly the Louisville great was a miscast rookie bench warmer without a place in the NBA. It would be a change of position that proved to revitalize a slumping start to his professional career. Jim Lynam, a first-year head coach of the Los Angeles Clippers in 1983, took a chance at working out Derek during the summer as a favor, as told by ESPN’s Tom Friend. He wasn’t, however, expecting much. After all, Lynam had faced Smith’s Warriors six times the previous season as Jack Ramsay’s assistant coach at Portland. Derek played only twice against the Trail Blazers and scored a grand total of four points. An intense showing of dunks, eerily similar to the time Bill Olsen saw a teenage Derek Smith dominate his high school coach’s drill, was impressive, but Jim Lynam still wanted to see him shooting the ball. That hadn’t been a particular strength of his. With Derek Smith signed to a minimum contract, the San Diego Clippers started the 1983-84 season going through the likes of Michael Brooks, Ricky Pierce, Craig Hodges and Greg Kelser to play alongside Norm Nixon on the perimeter. Derek had found his NBA position and a more consistent role, yet at times was still relied upon for less than ten minutes of playing time. A severe knee injury to Michael Brooks, who had gained the most trust from Jim Lynam out of the four and had started 30 games in a row, finally gave Derek an even bigger chance. Derek closed out the last 20 games of his season with 19 starts and the averages of 17.3 points per game (he averaged 9.8 for the whole year) on 57.9 percent shooting as the Clippers found its first consistent starting lineup of Bill Walton, James Donaldson, Terry Cummings, Derek Smith and Norm Nixon. Derek, meanwhile, could start to match up against the best shooting guards in the league. The Clippers organization itself was far from a well-run franchise, though. The team finished with a 30-52 record despite a number of promising players on the roster. Most of them acknowledged that they had ended up on the Clippers since their previous team had given up on them. The Clippers hadn’t made the playoffs since 1975-76 as the Buffalo Braves and wouldn’t do so again until 1991-92. The front office earned a reputation for being chaotic, while Donald Sterling’s ownership connoted cheapness. However, Derek’s performance down the stretch of that season was good enough that even the Clippers management matched an offer sheet from the Denver Nuggets (believed to be worth $800,000 over two years) and thus kept Derek Smith for the next two years. The jumpshot which now accompanied a versatile skillset of quickness, athleticism and tenacity might have been enough for Derek to succeed. But then there’s also the hands. The hands which coach Bill Olsen noticed in Kenny Robinson’s clippings and which helped him decide to go down to Georgia. Guarding Derek was a load for opposing shooting guards. He went at his match-ups ferociously, whether it meant driving at them, posting them up, attacking the glass for offensive rebounds or, now, also shooting over them. If one tried to beat him to the punch and front him, teammates could lob the ball over Smith’s defender for alley-oops which Derek could gather with his large mitts. Bill Walton, a very capable passer for a big man, in particular would search for Derek after he had backdoored his man. The first seventeen games of the 1984-85 campaign yielded seven 20-point games by Smith. Then came his opportunity to face rookie sensation Michael Jordan. MJ, who already had six 30-point games in the bag (the standout being a 45-point effort against San Antonio), had taken the league by storm with his incredible athletic abilities. But there are some things even Jordan, ten pounds lighter and 15 months younger, couldn’t handle. Smith went at the younger shooting guard from the very jump. To start, Derek held MJ off for a two off a Walton lob. He then over-powered him for an and-1 in the post. Derek also made a baseline off-the-dribble jumper as Jordan leaped at him. Finally, he crashed the glass for two points off the rebound over MJ. After the first quarter he already had eighteen points, with Jordan on him the majority of the time. Highlight plays like backdooring Jordan for another layup off a lob, slamming an alley-oop over Quintin Dailey and the famous fly-by poster over His Airness (completed thanks to those huge hands) only cemented an over-powering 33-point performance. Those 33 points were a career high, seven points more than his previous career high of 26. Derek Smith had simply man-handled the Chicago Bulls and Michael Jordan, who had a relatively meager 20 points to his name. Thanks to such a physical style of play, Derek attempted 6.3 free throw attempts per game in 1984-85. According to Basketball Reference, only did Michael Jordan, Sidney Moncrief and fellow low-post bruiser Adrian Dantley have a higher free throw attempt rate (the number of free throw attempts per field goal attempts) than Derek Smith did among outside players with at least 15 FGAs per game. The same group, plus Mark Aguirre and T.R. Dunn, were the sole perimeter players averaging more than two offensive rebounds per game. Derek was also top five among guards with 52 blocked shots. Playing against Derek had effectively become like facing a power forward in a shooting guard’s body. His Clippers, however, playing their first year at Los Angeles, were at a lowly record of 20-30 heading in the All-Star break. It wasn’t exactly a well known team for the average fan. Moreover, while a move from San Diego increased attendance, the numbers at the Memorial Sports Arena were still among the worst in the league. Needless to say, Derek wasn’t invited to Indianapolis that season. But it didn’t hold Smith back one bit. He upped his level of play even more and had a stellar finish to the 1984-85 campaign. At one point, he averaged 28 points per game on an unbelievable 60.4 percent shooting over a span of 22 games. Derek’s confidence had risen so high that at times he literally didn’t expect to miss a shot. Following a 35-point career-high performance at Seattle in late February in which he made 14 of 20 field goals, an unsatisfied Smith blamed himself. Described by head coach Don Chaney (who had replaced the fired Jim Lynam) as a “man on a mission”, Smith wouldn’t just quit on another lost Clippers season. The 2-guard’s heroics also gave interim coach Chaney plenty of hope late in yet another bad Clippers season. As Derek closed out the season with his second NBA Player of the Week award of the season after putting up 41 points on 23 field goal attempts against the Kansas City Kings, Don Chaney saw the unlimited future potential of his team’s leader. It had been another season of gradual improvement. If 1983-84 had been about transitioning from a bench player to a starter who could score 20, the 1984-85 season was about going from 20-point games to 30-point games. It truly had a been a season of All-Star level basketball by Derek Smith. Moreover, one only can understand coach Chaney’s passionate comments. Only 23 years old, known for an inimitable work ethic and drive, there was no reason why Derek Smith wouldn’t become even better. The Clippers had a brisk start to the 1985-86 season as they reached an unusually good record of 5-0. Forward Marques Johnson was back in form and would later be selected for his fifth career All-Star game appearance. Former 1981 Finals MVP Cedric Maxwell had been acquired in a trade which landed the Boston Celtics Bill Walton. The trade also allowed the up-and-coming James Donaldson play the starting center position. Point guard Norm Nixon — an All-Star the previous season– was slated to return from an injury soon. And, of course, Derek Smith was picking up right where he had left off at the end of last season with averages of 27.1 points per game on 55.9 percent shooting in the first nine contests of the year. Coach Chaney’s prediction seemingly had come to fruition. Derek snatched the season’s first NBA Player of the Week honors and was trailing only Alex English, Orlando Woolridge and Adrian Dantley in scoring before it all came to a grinding halt. A late-game drive through the lane on November 13 against the Seattle Supersonics ended in Derek Smith crashing to the floor, clutching his left knee and screaming in pain. Derek had suffered an extensive cartilage tear and underwent arthroscopic surgery soon after in which the damaged portion was removed. Not even Derek Smith could have gotten up from that. To make matters worse, the guard’s relationship with the Clippers organization began to sour as the rehabilitation process went awry. A premature return to the court for two games in December impeded Smith’s recovery. The rehab course was then affected even more when Derek started to feel unusually tired after workouts. A virus, which later in March was found out to be mononucleosis, was a point of so much friction that Derek had to defend himself from claims about faking the illness. The situation wasn’t resolved one bit during the summer as both sides had a dispute over unpaid bonus money. On top of that the Clippers somewhat low-balled Smith in free agency by reportedly offering a 5-million, 7-year contract which would have placed the go-to player of the franchise below Marques Johnson, Benoit Benjamin and Norm Nixon on the club’s salary scale. The Clippers’ front office tactics had once again ruined a relationship with a player to the point that he wanted nothing to do with the franchise. Consequently, Derek signed a 5-year offer sheet worth $4.5 million with the Sacramento Kings on August 7. The Kings — who gave up Larry Drew and Mike Woodson to the Clippers as part of compensation after the LA team matched the offer — were fresh off their first playoff appearance since moving from Kansas City and were looking to go all-in and make the next step. Unfortunately, things would only continue to go downhill for Smith. Derek played in only 87 games the next two seasons. His scoring average plummeted to 16.6 the first year and 12.7 in 1987-88. His mind-boggling efficiency from the field was down to a pedestrian 45.7 percent. A chronically sore left knee that had also developed tendinitis had robbed him of his dangerous first step. No longer the explosive athlete he previously was, Derek couldn’t get the lift he once had on drives and often ended up hobbling after his attacks to the basket. His jump shot, sadly enough, couldn’t make up for the aspects of the game in which he thrived thanks to his explosiveness. Statistical columns like offensive rebounds and free throws attempted, which previously highlighted an advantage of athleticism against opposing guards, saw significant drops. Teammates and friends don’t remember times of Derek complaining about his present situation, though. At times, the feisty Smith effectively played on one leg and continued to work hard, even if he reportedly couldn’t practice for two straight days. Derek’s unenviable situation eventually became a topic of discontent at Sacramento. The team had given up key pieces for Smith — even after being informed by their doctors that Derek only “can be 70, 80 percent of what he was” — and were disappointed when Smith sat out games as the Kings stumbled to a total of 53 wins in two seasons. As a part of that time’s NBA rules, the Clippers could match Sacramento’s offer for Derek Smith and receive compensation in return. The Kings had to trade Larry Drew, Mike Woodson, a 1st round draft pick and a 2nd rounder in a deal for Derek Smith, Junior Bridgeman and Franklin Edwards. Frustration by both sides created riffs between Derek and coaches Jerry Reynolds and Bill Russell. The chemistry of the locker room also worsened as the players couldn’t find a common ground. Coach Reynolds confirmed as much in his book “Reynolds Remembers”. According to Reynolds, the players who had been with the Kings previously became embittered about Derek’s declining abilities and place on the team. Smith’s inability to fulfill expectations generated annoyance and made the team miss Woodson and Drew. Ultimately, an argument with head coach Jerry Reynolds (who had been an interim both previous years after Phil Johnson and Bill Russell were fired) in Derek’s third year (1988-89) at Sacramento lead to a suspension and his contract being bought out. Philadelphia quickly picked him up and closed the chapter on Derek’s “worst 2 1/2 years of his life“. The 76ers were lead by Jim Lynam who wasn’t bothered by Derek’s alleged attitude problem at Sacramento. Smith’s health had deteriorated during his time in Sacramento, though. Maladies like a fractured left eye rim filled out the medical history of the guard. With seven operations in five years on his resume (three on his left knee, two on his left eye, one on his right hip, another on his right elbow), Smith was now spending the majority of his time doing an ungodly amount of treatment just to hang on as a veteran bench player for the Sixers. Already distancing himself from his previous great form and speaking of his Clippers days as “that Derek Smith”, he averaged 8.9 points on 50.8 percent shooting from the field (his best percentage since Los Angeles) in 18.7 minutes per game in 1989-90. The Philadelphia 76ers finished the 1989-90 season with a 53-29 record and their first division title since 1983. However, when it was time for the biggest post-season run of Derek’s career, his body failed him. Despite all of the work he had put in, Smith was capable of playing in only one of Philadelphia’s playoff contests as the team suffered a 1-4 loss in the Eastern Semifinals against Jordan’s Chicago Bulls. Smith had successfully started three games in March in the place of the injured Rick Mahorn. Yet such a step only worsened Smith’s condition in the long run. Tendinitis in the left knee pretty much kept him from playing in the post-season. 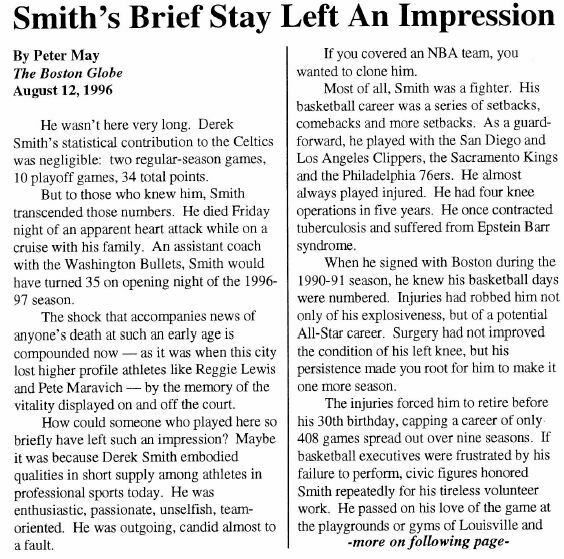 Saying that Derek Smith’s NBA career ended with his body quitting on him at Sacramento and Philadelphia wouldn’t be doing his basketball story any justice. On December 22, 1990 he signed with the Boston Celtics for the remainder of the season. He had withstood four knee surgeries in the last five years and was still undergoing rehabilitation after a left knee operation in September, yet the Celtics wanted his veteran presence. Despite playing his first game in a Celtics uniform only four months later, Derek was included on Boston’s playoff roster. He even saw playing time in every game of the first round series against the Indiana Pacers. With 20 minutes total to his name in the first four games, head coach Chris Ford entrusted Derek for his last hurrah. Ford unleashed Smith on the young and braggadocios Chuck Person, who had scored 39 in Game 2 and set an NBA playoffs record of 7 threes made. Person was already at nine points early in the fifth and deciding game of the series. Equipped with a huge pad on his left knee and playing on a knee injection, Derek exerted whatever mobility his body still had and face-guarded Person on almost every possession. More often than not, it was done by holding, grabbing and shoving the younger Pacer as the two exchanged trash talk from before the pre-game anthem until the final buzzer sounded. Indiana’s dangerous marksman wasn’t to move from one spot to another unmolested. The veteran guard gave up only one field goal to Person, a ridiculous fall-away three after Derek had tested the limits of the hand-checking rule. He also shut him down on the most important possession of the game. A good eight seconds of battling for post position concluded with Chuck Person missing a wild three-pointer which would have given Indiana a one-point lead. In the end, Derek’s spirited performance, which earned a well-deserved standing ovation from the Boston Garden’s crowd, probably ranked second in importance to Larry Bird’s 32 points. Bird had famously returned to the court following a nasty spill on which he banged his head against the parquet floor. It was a basketball victory for Derek who had finally found himself again. After struggling for so long in Los Angeles and Sacramento as he tried to return to his 20-point form, he had been a vital role player for Boston. It was something tendinitis had prevented him from being on Philadelphia’s playoff run. Boston lost in six games to Detroit in the second round and Derek called it quits despite an extension offer from the Celtics. With one good knee left, he wanted to make sure that he could play with his son Nolan as he grew up. Three years later, though, old pal Jim Lynam persuaded Smith to return to the league as his assistant coach for the Washington Bullets. Derek, being very attached to his children, agreed to do so on the condition that he could bring Nolan with him everywhere. Lynam complied and Nolan, in effect, became a part of the Bullets, going on trips, showing up for practices and doing drills with Washington’s players. As Derek was coaching the team, he also taught Nolan the character and work ethic that had once made himself successful. Meanwhile, Derek exhibited a similar influence on the rather young Bullets squad. Smith earned the role of the coach who could reach Washington’s young and flamboyant stars, from Fab Five’s Chris Webber and Juwan Howard to the heady Rasheed Wallace. The team improved its 21-win mark in 1994-95, Derek’s first year, to 39 wins in 1995-96. Every player on the team began to vouch for Derek and his impact on their success and improvement. Life played out a cruel joke on Derek Smith when he met his fate on August 9, 1996. Derek and has family had gone on a cruise for the Bullets and Capitals organizations and its season ticket holders. On its last day, as the cruise ship returned from Bermuda, Derek’s head suddenly dropped mid-sentence while talking to fellow travelers. Colleagues and medical personnel, stunned by what had just happened, rushed to help and resuscitate him. After about a half hour they gave up on their efforts. The man with unquestionable heart had suffered from a heart defect, a condition caused by an abnormality in the mitral valve which had never been previously discovered. Derek’s character had left such an imprint on people around him that there were two funerals, one in Hogansville and one in Louisville. The latter was attended by 3,000 people, many of whom couldn’t make it inside the church. For the people who had crossed paths with Derek during their life, he was much more than a basketball player. They were grieving over the loss of one of the most briliant persons they had ever met. As numerous journalists wrote their eulogies, there was no end to the stories Derek’s acquaintances could tell about his positive effect on others. Louisville’s assistant coach Scott Davenport shared his memories with Russ Brown of how enthusiastic Bill Olsen was about Smith’s qualities as a person when he first attended the university. Others, who had only briefly interacted with Derek, wondered how it is so that he still managed to leave such an impact on them. The Boston Globe’s Peter May asked himself this question when articulating the effect of Derek on the Boston Celtics, a team for which he played 12 games total. From best friends to one-time teammates, everyone was and still is devastated by the loss of Derek. His left knee might have prevented him from what could have been the career of a perennial All-Star. But his death robbed society from a definite first class human being off the court. Derek’s impact also manifested itself in countless contributions to communities. Between organizing camps for children, speaking at schools, hosting fundraisers to raise money for health facilities in need, he spent an enormous amount of time to help the youth. “Grinker said he could recall one time when he was mad at Smith,” Adande wrote. “His clients used to gather in Grinker’s home town of Cincinnati to work out before each season. One time, Grinker waited at Xavier University for two hours and no one was there. He heard that Smith had taken them somewhere. It turned out Smith had read about a youth who had been arrested for selling drugs. Smith had taken all of Grinker’s clients, who included Danny Manning and Craig Ehlo, to talk to the youth to make sure it didn’t happen again. Really nice story. Thank You. Wow absolutely incredible! Best Derek Smith account I’ve ever read. Very nicely done, thanks a lot for sharing it. Thanks for the very kind words and for giving it a read, tb727! I concur…an excellent piece on an amazing player. Derek Smith: Grande jogador, ótimo jogador de basquete. Sensacional! This entry was posted on October 19, 2016 by ReinisLacis in Vintage NBA and tagged Derek Smith.